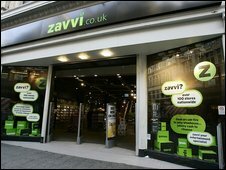 The adminstrators of music, games and DVD chain Zavvi have closed 22 of the firm's stores with immediate effect - costing 178 jobs. The remaining 92 stores will stay open, with a sale of up to 50% off beginning on Friday, Ernst and Young said. The troubled chain has been badly affected by the demise of Woolworths, which forced it to stop taking new orders via its website. The administrator said it still aimed to sell Zavvi as a going concern. "Despite record consumer demand since Christmas, it is no longer possible to support continued trading across all of the Zavvi stores," said Tom Jack of Ernst & Young. "Unfortunately, the current difficulties faced on the UK High Street seem to be discouraging retailers from investing in a significant number of new stores." He added there had been 60 expressions of interest in all or part of the business. Zavvi's main supplier was Woolworths' unit Entertainment UK (EUK), which went into administration in late November. Since then, Zavvi has had difficulties in sourcing stock and has been forced to enter new trading arrangements. The Zavvi group is the UK's largest independent entertainment retailer. It was formed after a management buy-out of the Virgin Megastore division of the Virgin Group in September 2007.